Screen gross solids and floatables at small and medium-size CSO facilities. 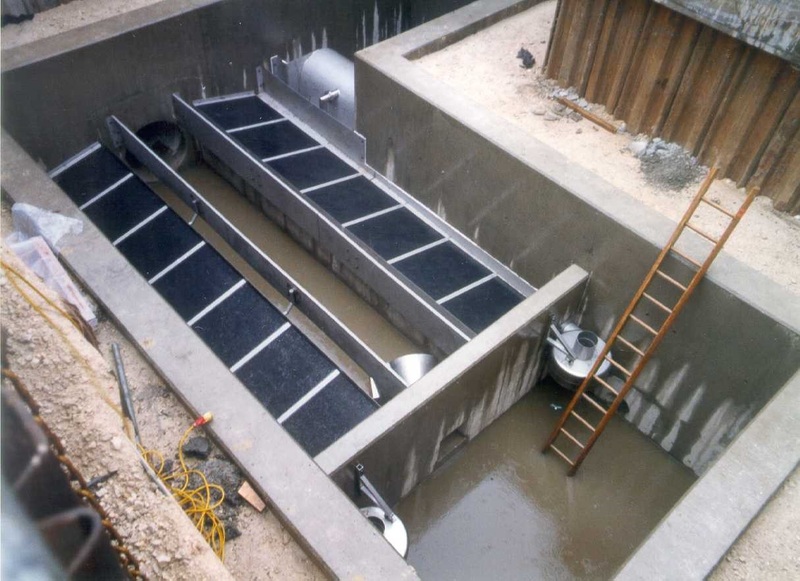 The Hydro-Jet® Screen is a high-capacity combined sewer overflow and wet weather screen that is both efficient and self-sufficient. Self cleaning, with no moving parts and no power requirements, the Hydro-Jet® Screen provides screening at high hydraulic throughput in a small footprint, reducing site space requirements and maintenance costs. The system requires very little maintenance, making it ideal for small to medium-size remote or satellite CSO sites. The Hydro-Jet® Screen is a high-capacity combined sewer overflow (CSO) and wet weather screen that is both efficient and self-sufficient. Self cleaning, with no moving parts and no power requirements, the Hydro-Jet® Screen provides screening at high hydraulic throughput in a small footprint, reducing site space requirements and maintenance costs. 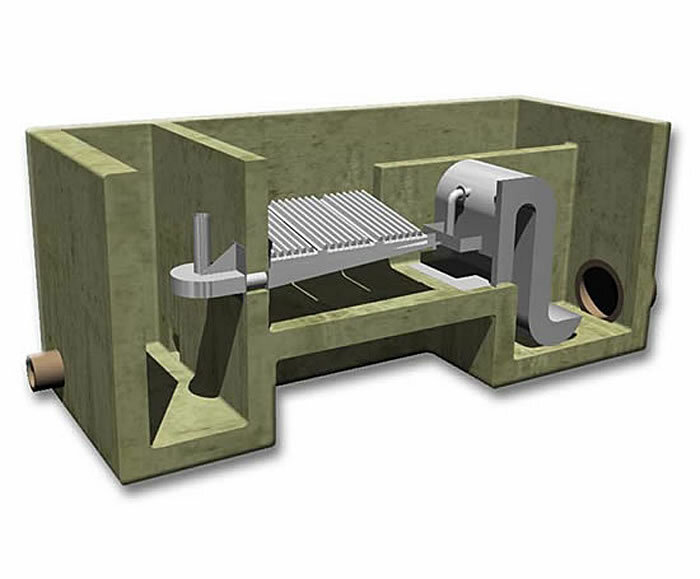 Designed to intercept and retain aesthetically offensive material and gross solids at all states of flow and then return the material to the foul sewer during and after the storm event, the Hydro-Jet® Screen uses corrugated screen panels to increase capacity without increasing footprint, making it perfectly suited to small and medium-size CSO sites. 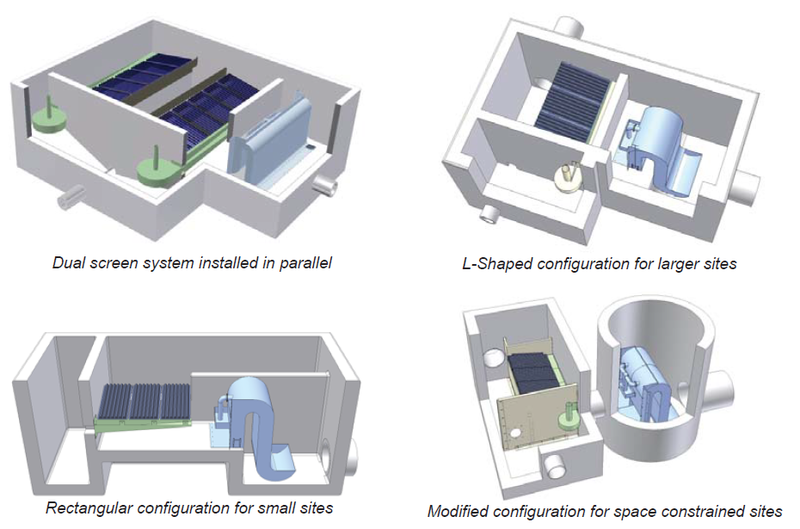 It is available in a number of different configurations and can be installed in a purpose-built chamber, retrofitted into existing CSO structures or packaged as a standalone unit. You can watch a brief video demonstrating the Hydro-Jet® Screen here. Download the Hydro-Jet® Screen brochure here. Hydro-Jet® Screen is a compact system that works extremely efficiently, allowing a high hydraulic throughput in a small CSO site space. The Hydro-Jet® Screen has no moving parts and no power requirements, meaning that the risk of breakage or downtime is very low. Further, the coated screen panel prevents grease buildup and blinding to ensure that the system continues to function optimally, and the screen is kept clean by a dynamic backwashing system produced by the hydraulic head present within the sewer system. Self-cleaning and self-activating, with no power or moving parts, high-quality design materials ensure that every Hydro-Jet® Screen is built to last. Dry weather flows pass through the Hydro-Jet® Screen chamber (red arrow) via the dry weather channel and continues to a downstream treatment plant (brown arrow). During wet weather events, the flow increases as runoff drains into the combined sewer system. The water level in the dry weather flow channel rises as the flow control limits the flow passed through the continuation flow outlet. Water in the dry weather flow channel rises until it spills over the weir wall and flows down through the angled self-cleansing screen. As the water level under the screen rises to the crest of the siphon, the pocket of air trapped between the water surface and the screen creates a backwash mechanism. Debris is lifted off the screen and carried down the screenings channel, which is returned to the continuation flow (green arrow). The siphon breaks, discharging the screened effluent (blue arrow) to the receiving water body while drawing the water level in the overflow spillway down. Flows from 1-10 MGD can generally be accommodated within a rectangular chamber. Due to the size of siphon required, flows greater than 10 MGD will require an L-shaped chamber configuration. The weight of a single screen panel (4 ft x 2 ft) is 44 lbs. The maximum recommended loading rate is 294 US gal/min/ft2, which equates to 3.4 MGD per screen panel. A.The average flow rate through the screenings return Hydro-Brake® flow control is in the order of 119 GPM for a 6 inch outlet diameter. A 6 inch outlet diameter is the minimum recommended size unit for use on foul and combined sewer systems. In some instances there may be scope to increase the size of the screenings return Hydro-Brake® flow control, though this will depend on the continuation flow rate into the downstream sewer. The screenings return flow control is an integral part of the Hydro-Jet® Screen system, essential for restricting the amount of flow that is returned to the collection system. Without it, this flow component would be substantially more. With less water flowing to the siphon, the time taken for a backwash to occur will increase thus reducing the backwash efficiency. A.The Hydro-Jet® Screen is unlike weir-mounted screening devices that impose an additional headloss on the system that needs to be taken into account. The top water level in the Hydro-Jet® Screen under normal operating conditions is determined by the weir level and weir length for a given flow rate since the siphon has a capacity in excess of the incoming design flow. A.The Hydro-Jet® Screen has successfully been retrofitted into many existing CSOs, though due to the specific restraints of such projects the layout of the key Hydro-Jet® Screen components (siphon, screen, weir etc) may differ from those suggested in our standard arrangements. A.The rectangular configuration is typically appropriate for smaller sites, while the L-shaped configuration is typically appropriate for larger sites. Modified configurations are also available for constrained sites. Please contact us to discuss your specific site requirements. Hydro stands behind our products with a service department commited to ensuring our client's satisfaction. Learn how the Hydro-Jet® Screen system screens gross solids and floatables at small and medium-size CSO facilities. Partial sewer separation was accomplished using a Hydro-Jet® Screen and a Hydro-Brake® vortex valve supplied by Hydro International in a satellite treatment application. Sheffield Heliscreen retrofits into an existing chamber under a highway to save install costs and footprint. The self cleansing, low-headloss, and cost effective Heliscreen® supplied by Hydro International provided the solution the city was looking for. Log in to our Support area to get design guides, drawings and other resources.